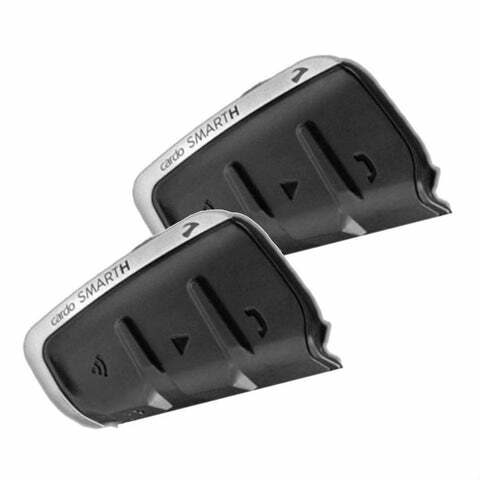 Motorcycle Intercoms & Headsets| LD Motorcycles – Tagged "Scala Rider"
From entry level to top end Bluetooth systems we stock intercoms and headset devices to suit any budget and preference; making it easy to connect rider to rider or rider to pillion. Most devices also include connectivity with other Bluetooth devices such as mobile phones! 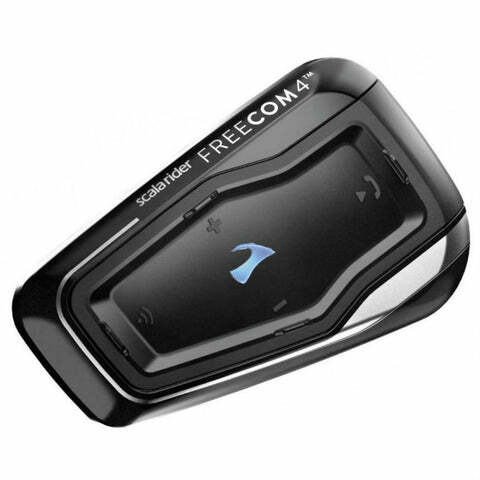 The Scala Rider Freecom 2 was created for riders who like to tour either in a pair or alone, keeping you connected no matter where you are while the sturdy waterproof and dustproof control unit makes communicating in even the toughest conditions easy. 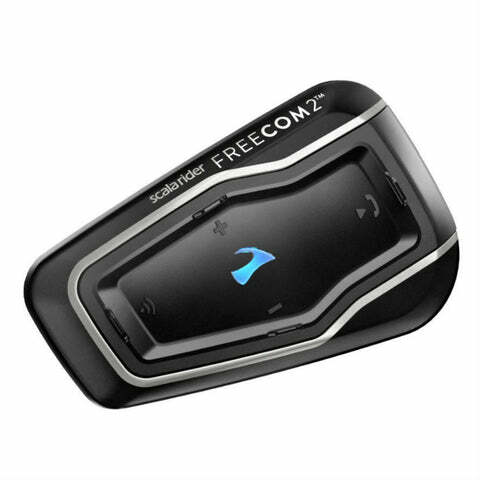 The Freecom 2 also features a 2 channel bluetooth system that allows you to connect to your passengers headset while still listening music or GPS instructions. 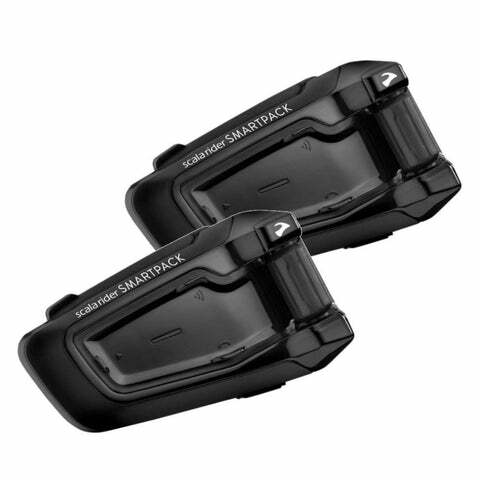 Sharing music or FM radio with your pillion is also possible thanks to the multiple connectivity options available. Whether it's pointing out things in the scenery or just general chat the Freecom 2 is the perfect system for simple interconnectivity. 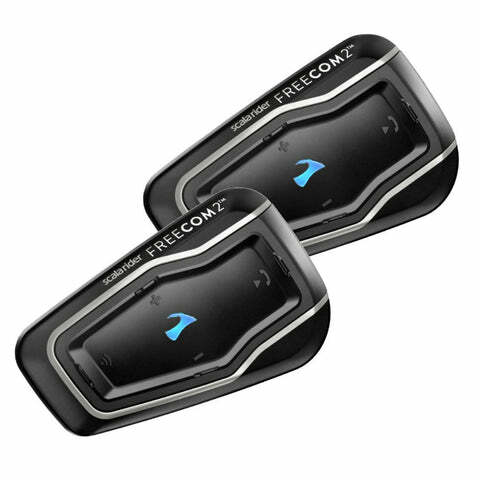 The Freecom 2 allows full-duplex Bluetooth intercom communication for chatting with a passenger/nearby rider on Cardo or non-Cardo devices. With AGC technology built-in, the volume of your Freecom 2 automatically adjusts according to background noises and riding ambience. With safety in mind, voice activation technology (VOX) takes care of answering calls hands-free. 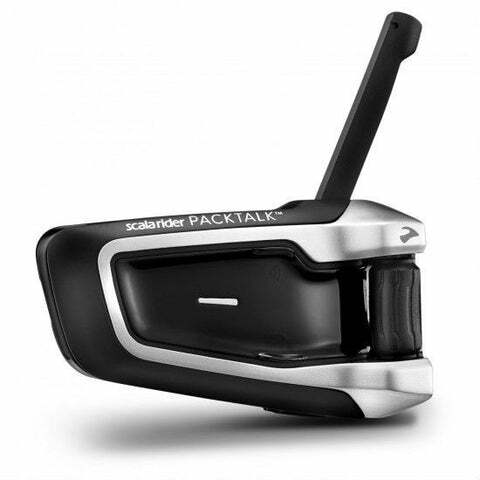 The Scala Rider Freecom 4 is a headset that opens up all options when out riding with your group allowing you to have bike-to-bike chats between 4 riders at a range of up to 1.2km away*, even if they are using non-Cardo headsets. 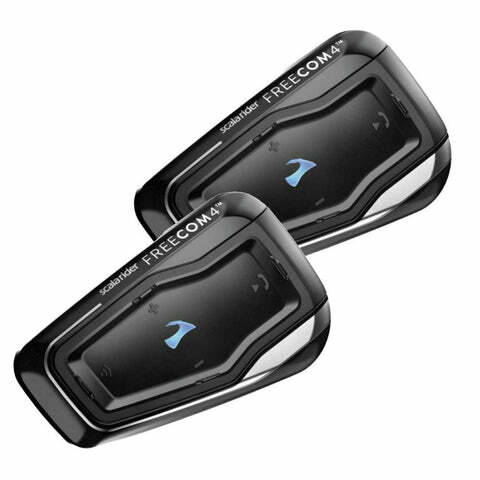 The Freecom 4 features a 2 channel bluetooth system that allows you to connect to your passengers headset while still listening music or GPS instructions. 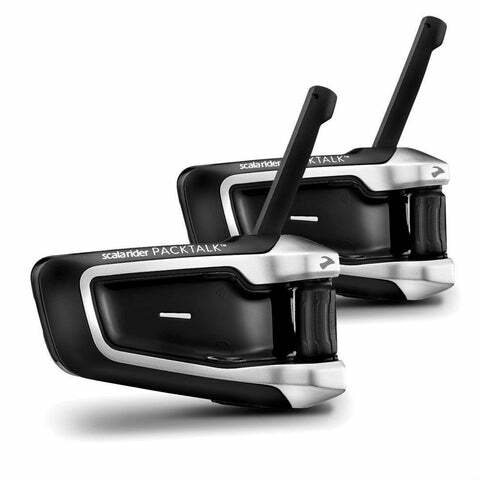 Sharing music or FM radio with other riders in your group is also possible thanks to the multiple connectivity options available. Whether it's pointing out things in the scenery or just general chat the Freecom 4 is the perfect system for simple interconnectivity. With AGC technology built-in, the volume of your Freecom 4 automatically adjusts according to background noises and riding ambience. With safety in mind, voice activation technology (VOX) takes care of answering calls hands-free. Interchangeable hybrid-boom and wired microphones. Velcro spacers (for speakers if needed). 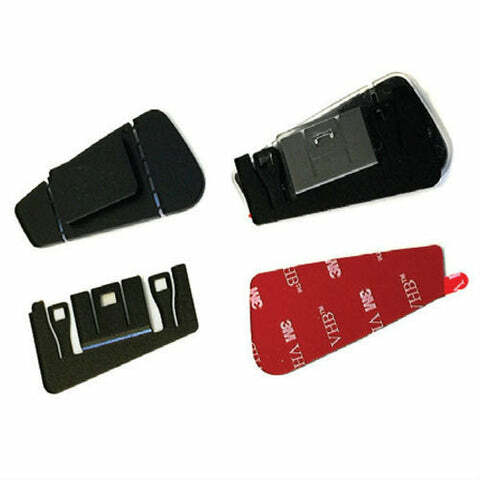 ** Duo kits will include 2 of everything except the Installation Guide and Pocket Guide. 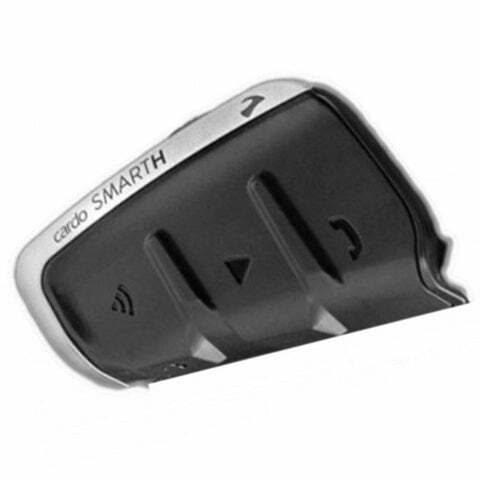 DMC is a new age technology developed by Cardo to completely change how group riders communicate with each other. Instead of the traditional Bluetooth 'daisy-chain' intercom connection, the group is connected in a dynamic network to ensure that communication remains uninterrupted at all times. 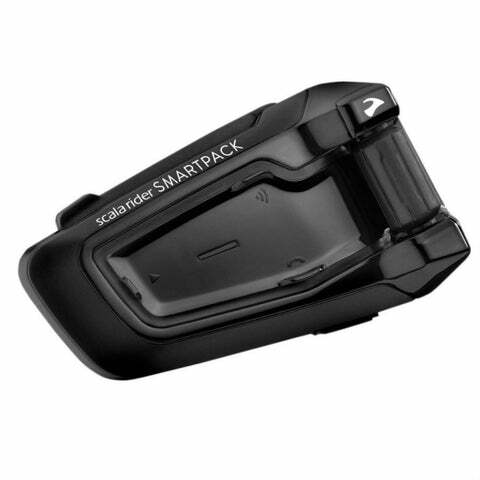 In SMARTPACK's DMC Intercom mode, a group of 4 riders can communicate at a remarkable range of up to 5 miles / 8 km, and any of the members can leave / join the group, or receive incoming phone calls at any given time, without compromising the conversation for the rest of the group.